IN his famous book Freedom at Midnight, French author Lapierre states that on an average each maharaja in India had 3.5 Rolls-Royce automobiles. If we were to stick to the correct number of maharajas — 225 of them (those who had gun salutes fired in their honour were entitled to the title, all others were merely rajas — that would mean that from 1908 to 1939 (when World War II started), the maharajas had bought at least 788 Rolls-Royce cars. If you include the rajas, it could be more. Automobile historian John M. Faisal states that in all, before 1947, a total of 900 Rolls-Royce cars were sold to Indian princes. The craze the Indian princes had for exotic automobiles in the first four decades of the twentieth century is well known. After World War I, many of the Indian princes spent a lot of money on famous American automobile brands like Cadillacs, Chryslers and Lincoln, but none of the non-British brands appealed to the maharajas as the Rolls-Royce. In fact, the very first Rolls-Royce that came off the assembly lines after World War II (1939-45) was bought by Maharaja Pratap Singh Gaekwar of Baroda. The very first Rolls-Royce bought by a "native Indian prince" was the "Pearl of the East". It was purchased by the Maharaja of Gwalior after its record breaking trans-India runs in 1908. Soon the Indian rulers began to order exotic versions. The handbook of the grand 40/50 h.p. 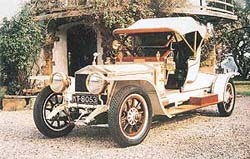 Silver Ghost, sent to His Highness the Nizam of Hyderabad in March 1913 by Rolls-Royce, stated that it was a "Semi-State Coach". Actually it was a sort of throne car, painted in a rich canary yellow with gold mountings, upholstered in gold silk brocade with matching curtains and brocade. And this was only one of the Nizam’s 50 Rolls-Royces, many of which still have their original paint. They had barely done one thousand miles when he died in 1967. But it appears that despite his dozens of exotic automobiles (numbering more than 200), the Nizam used only one of his old Buicks to do his circuits of Hyderabad city. In 1920, a Silver Ghost limousine was sold to the Viceroy of India. Later this was bought by the Raja of Monghyr, who deputed a well-known Calcutta jeweller to decorate the car with silver plate as per Indian designs. This car was said to be the most ornate Rolls-Royce in India. Many maharajas preferred the Cabriolet version, which enabled them to sit on a raised seat in the rear of the automobile so that their subjects would be able to recognise the ruler and pay homage. Talking to the librarian in the Rolls-Royce archives in London, I found that although the firm sold their automobiles to quite a number of maharajas, they considered the Maharaja of Mysore special, for he always bought Rolls-Royces in batches of seven! So much so that in Rolls-Royce parlance "doing a Mysore" meant selling seven cars at the same time. Another famous buyer was the Maharaja of Bharatpur (He always bought three automobiles at the same time). Once when the Rolls-Royce firm delayed sending mechanics to his capital to rectify small faults in the cars, the maharaja threatened to convert all his Rolls-Royces into garbage carriers. Lest the car lose its "aura" as the automobile for the super rich, the car-makers sent a group of mechanics at the earliest to Bharatpur. Another enthusiastic buyer was the Maharaja of Patiala, whose Rolls-Royces (27 among his hundreds of vintage makes) were decorated with diamonds and precious stones — so much so that during the overhaul of his cars, elite security guards had to be positioned in the garage to prevent pilferage. The Maharaja of Nabha had one Rolls Royce — with its body built to resemble a swan. When the car made its slow progress on the streets, it had the gracious appearance of a swan taking to water. Jawaharlal Nehru, referring to this automobile in one of his books, wrote that the maharaja was known as "Bathak (Hindi for goose) Raja" as the onlookers could not differentiate between the goose and swan. The Maharaja of Darbhanga had a number of Rolls-Royces and according to a recent newspaper report, six of them are rusting in the old family garage at Darbhanga. The Maharaja of Faridkot too was fond of Rolls-Royce. Late last year, one automobile enthusiast managed to get a peep into the padlocked palace garage and came back goggle-eyed after counting six Rolls-Royces, two Bentleys and four Jaguars rusting away. The maharajas used the Rolls-Royce as a vehicle for tiger hunting as well. These special cars had extra footboards for the servants to stand while the car rushed through the forest in pursuit of the tiger and a special high power "farlight screen mounted tiger shooting lamp" dazzled the tiger’s eyes and made it an easy victim. One of the books on Rolls-Royce states that a particular model bought by the H.H. Aga Khan II in the early 1930s was considered to be so unique that the manufacturers made an arrangement with him that the car would be sold back to them for its market value after his demise. Independence found the maharajas with dozens of Rolls-Royces but no money to maintain them. In the early sixties, many cars were surreptitiously sold to the foreign vintage car connoisseurs under the plea that the car was being sent out of India for repair as the spare parts were not available in the country. By 1971, when privy purses were abolished, the Government of India became wise to this kind of selling and decided that the cars could be sold outside India, provided the sale price money was brought back to India in foreign exchange. The Jodhpur "Ghost of India" was one such car sold in the 1970s. The "Swan" car was sold by the erstwhile Maharani of Nabha to an "Indian buyer" in the 1990s. The Indian buyer proved to be an agent for a foreign vintage car enthusiast and had the car sent out of India. By the time Indian vintage car experts came to know of the sale, it was too late. This car is now said to be in an Amsterdam museum. However, not all the princes were happy with the smooth running engine of the Rolls-Royce, which barely made a noise. The Nawab of Arcot in South India suddenly stopped coming to Madras city in his antique Rolls-Royce. Instead he attended meetings and conferences in an old car of a different make. When queried as to why he chose the inferior car for his trips, his straight-faced answer was: "Well... the Rolls-Royce does not make any sound when I drive it, even in high speed. During my use of the car in estates, my tenants do not get a chance to look up and pay me homage.... As such I have to use this cheaper and more noisy model, which gives advance notice of my coming!"